In his paper “The Tourism Industry in the Caribbean after Castro,” Art Padilla makes his case. His historical analysis of the tourism industry in the Caribbean and particularly in Cuba reflects an exhaustive research effort on the growth of the industry in the region. Cuba’s impressive tourism industry development in just over ten years can only be compared to the postwar development of the tourism industry in the Mediterranean coast of Spain. Coincidentally, the extraordinary efforts and subsequent success of the Cuban and Spanish tourism industries was triggered by comparable catastrophic economic reasons. Spain and Cuba embraced the support of and allied with the tyrannical regimes of foreign powers that aspired to dominate the World. After these regimes were defeated, democracy began to emerge. As economic support that was based on politics and ideology disappeared, Spain and Cuba turned to tourism as the quickest way to recover from their past. Spain and Cuba re-discovered their most important renewable economic resource, tourism. Padilla’s compilation of prognosis of the future of the tourism industry of the Caribbean by experts is presented in his paper in an orderly and systematic fashion. He also touches on the current marketing strategies of Cuba and other Caribbean destinations and suggests strategies for retaining their current number of visitors and revenues as well as programs for future growth and improvement of their competitive position in the region. Cuba has attained in more than a decade, a hotel inventory totaling 40,000 rooms. Like the Dominican Republic, Cuba achieved spectacular growth without the contribution of U.S. investors and visitors. However, during the last five years, the Dominican Republic has increased its efforts to penetrate the American market and the newly-built products are geared to satisfy the demands of American tourists. Despite the expansion in the tourism industry in Cuba, the “Big Island’s” peculiar type of state capitalism has failed to provide benefits to the majority of its inhabitants, except, in a minimal way to those privileged to have a job within the hospitality industry. Padilla cites estimates of profitability of Cuba’s tourism industry by several credible and responsible authors. Sometimes there are discrepancies when figures and statistics are presented without taking the time factor into consideration. In other cases the comparison of data is affected by changes in methodology or misinterpretation of trade or industry terminology. The three principal entrepreneurial parties in the Cuba tourism development scene are: (1) the Foreign Investor (lender); (2) the Foreign Operator; and (3) a Cuban Corporation. e.g., Cubanacán, Gaviota, Horizontes, etc. Considering that the economy of Cuba is centralized, the accounting of revenue and expenses related to joint ventures, particularly those in hospitality and tourism activities, is incredibly convoluted. To simplify matters, we will use an example from one of the principal Spanish investors/operators in the Island. The cost of a hotel from the Cuban Corporation’s point of view is a fictitious figure that comprises: (1) the labor and materials originating in Cuba, valued in dollars at standard world prices; and (2) the imported materials and equipment, valued at actual dollar cost. This total cost is used to calculate the amortization at the time of calculating profits shared by the Foreign Operator and the Cuban Corporation. Cuba profits greatly from the difference between the fictitious cost and the actual salary expense and cost of locally produced materials. Regarding the management of hotel operations, where a Foreign Operator is involved, the Cuban Corporation controls the accounting of hotel revenues from a centralized office. Labor expense is allocated to the hotel accounts in U.S. dollars, although it is paid out in pesos by the government labor agency that pays directly to the worker. Salaries, even when expressed in dollars, represent about one third of the standard salaries in the rest of the Caribbean. (Salary and other compensation in the Caribbean averages 35-40 % of total revenue, while the comparable percentage in Cuba is only 10-11%.) The higher cost of imported materials and supplies acquired and paid in hard currency is offset by the lower salary cost, even when expressed in U.S. dollars. • the Foreign Investor gets paid interest and loan amortization from the operating profits before profit distribution to the Foreign Operator and the Cuban Corporation (by the way, loans are unsecured). • the Foreign Operator normally obtains compensation in the form of management fees and profits that are similar to comparable operations outside Cuba. This is attributed to the low labor cost in Cuba. • the Cuban Corporation benefits from the labor manipulation scheme and dollar valuation of the locally produced materials. They create a profit margin unique in the industry, although there are known previous cases in Jakarta and Bali in Indonesia. 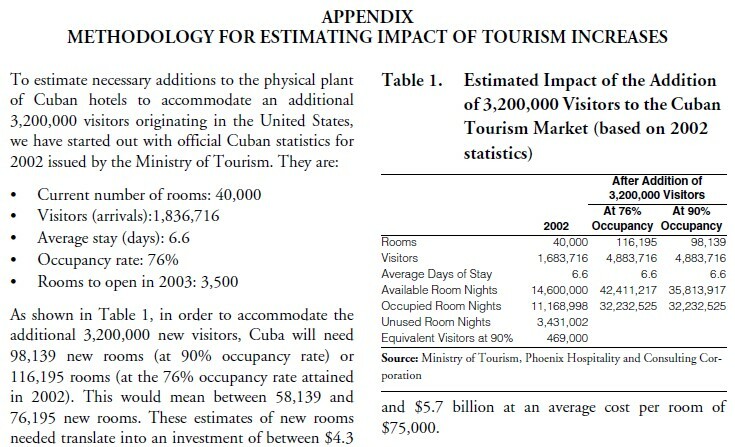 This simplified analysis is intended to explain the mechanics of Cuba’s apparent success in the tourism industry through the exploitation of its work force. I fully share Padilla’s decision to limit his analysis to the “democratic scenario.” Otherwise, the crystal balling could become a major Monte Carlo roulette exercise. In addition to its natural resources and exotic allure of the destination, Cuba’s proximity to the affluent and populated east and south coasts of the U.S. and the potentially easy access to its eleven international airports are its main competitive advantages when compared to the rest of the Caribbean. Cuba is already planning for the American market. For example, a planned world-class multi-use resort development in Jibacoa and the introduction of the Paradisus upscale brand of Melia’s all-inclusive hotels. Cuba is opening new properties and refurbishing others at the rate of 2,000/3,500 rooms per year. Cuba is also depending on the current 40,000-hotel room inventory and is seriously planning development of meeting and convention facilities to accommodate an international clientele. The three studies mentioned by Padilla have their own merits and do not require further addressing. However the estimate of 3.2 million additional visitors from the United States calculated by the Center for International Policy deserves some analysis. Taking the Ministry of Tourism’s published data for 2002, we have calculated the number of hotel rooms necessary to accommodate 3,200,000 additional visitors from the United States. We assume that the visitors from other sources already traveling to Cuba will remain unchanged. We used the same occupancy rate and the same average length of stay reported for 2002. In addition we made similar calculations using a 90% occupancy rate. The detailed methodology is set out in the annex. Our calculations indicate that in order to accommodate 3,200,000 additional tourists, Cuba would require between 98,000 and 116,000 hotel rooms. At the current rate of 3,500 new hotel rooms opened per year, it would take 16.6 to 21.8 years to build an additional 58,000 to 76,000 rooms. (With its current 40,000 rooms, Cuba could accommodate 469,000 additional visitors by elevating its occupancy rate to 90% on an annual basis.) The seasonal patterns of the region and profile of tourism makes it practically impossible to attain higher occupancy overall. Regarding air transportation for the additional visitors, we have not factored the additional flights and equipment required for its airlift. We also have not addressed the significant cost of building the additional rooms, estimated at between $4.3 billion and $5.7 billion, based on an average cost of $75,000 per room. While Cuba prepares for the advent of American visitors by developing new products and converting existing properties to satisfy the quality and standards demanded by the American traveler, other Caribbean destinations are also planning to strengthen their market position and products for the future. This will continue irrespectively of Cuba’s obtaining access to the American market. The following selected projects are on the planning stage or under different stages of development in the Caribbean. Our selection was made in view of the competitive nature of each project in the Caribbean region. The Cap Cana project is positioned as a luxury resort/ residential community and encompasses 29,000 acres overlooking five miles of stunning beaches on the eastern coast of the Dominican Republic. Even though Cap Cana is only 15 minutes from Punta Cana International airport and a number of first class resorts, its immediate area has a very low population density and a pristine natural environment. The project comprises eight hotels; golf courses and marinas; real estate components such as single and multifamily units; and other amenities such as equestrian activities, polo, tennis, a 5,000-seat open-air amphitheatre and a world class European style casino. The 580,000 square feet convention center will be a part of a large-scale district development project encompassing a 500-room headquarter hotel, offices, residential, retail, restaurant and other urban development uses. It is a private and public sector project offering attractions and facilities for convention participants, business travelers, tourists, as well as local residents. The convention center itself promises to rank on a par with the world’s leading convention centers in both design and functionality. The $416 million convention center will position Puerto Rico as a major destination in the Caribbean for conventions, trade shows, consumer shows and conferences targeting North America, Latin America and the Caribbean convention markets. Puerto Rico currently has approximately 12,800 rooms, and through innovative tax incentive and financial programs, continues to support new hotel development. In 2002, $427 million were invested in in new hotel and resort development, including six major hotels and resorts and the aforementioned convention center. The Baru Island Resort planned for Cartagena, Colombia, consists of 3,225 acres on the island of the same name. The peninsula became an island after the construction of the Canal del Dique during the Spanish colonial period to provide Cartagena a waterway to the interior or the country through the Magdalena River. The initial phase of the master plan calls for a marina, an 18-hole golf course, golf clubhouse, a hotel and a variety of real estate components. The whole plan calls for an additional hotel and golf course and marina and real estate components of diverse size and price up to 2,600 units. Other amenities will be added as the project progresses. In addition to the mature developments in Cancun, Isla Mujeres and Cozumel, the Mundo Maya and the Riviera Maya resorts, south of Cancun, continue their rapid development. The governments of Mexico, Guatemala and Belize are creating a special cultural passport for tourists to move around different spectacular Mayan ruins with minimum hassle. As an example of new niche marketing, two hotels opened in this area to cater to a special segment of the market: the obese or oversized traveler. Doors and elevators are wider and bedding has been redesigned as well as the bathrooms. Beach chairs are made of wood to accommodate the extra weight of the customers. Restaurants provide buffet service and its chairs are 60 percent wider and stronger than usual. The Atlantis plans a major expansion of this successful mega resort that currently comprises 2,300 rooms, a marina, casino, 38 restaurants, spectacular aquarium and 11 exhibit lagoons, and a wide range of amenities. In conclusion, and with the assistance of my crystal ball, I believe that the tourism avalanche to Cuba will not occur, at least not abruptly as forecasted, as the existing room supply is inadequate to accommodate such a number of new visitors to Cuba. I hope that the tourist “avalanche” will be gradual, more like a blow of snowflakes and driven first by ethnic tourism, business travelers and the price conscious traveler in search of a good value and curious about this new exotic destination. Some of the small island competitors that cannot afford an adequate promotional budget, will suffer relatively more from growth of Cuban tourism than the bigger islands with an established critical mass of rooms and significant marketing and promotion budget. There are many elements that have to be in place to ensure a successful tourism industry, from airlift to trained staff to availability of infrastructure necessary to support the development of lodging facilities tailored to the U.S. market. Cuba, as the largest of the islands in the Caribbean with its numerous and varied unexplored natural tourism resources, eventually will claim its natural position in the Caribbean region. However, this will not happen instantly or in the immediate future after Castro.